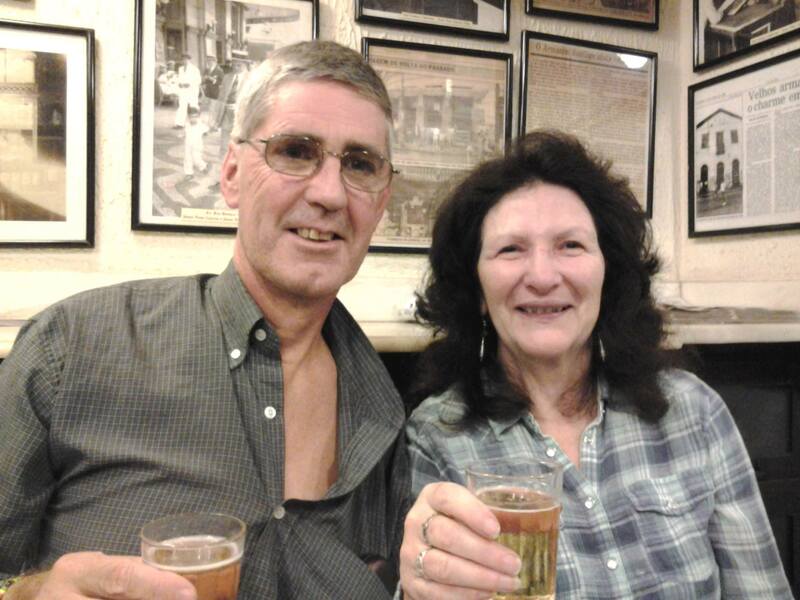 Great newsy journal update from Dave and Shelagh who are now into their third week at the Living & Learning project in Rio. Arrived tired but safe to be picked up at the airport by Beth. Lots of hugs. 4 big bags packed with teaching resources and some musical instruments for Tom (much much cheaper in the UK than Brasil). One bag weighed 28 kilos – good old TAP. Drive to the house in Santa Teresa to meet the landlady – a friend (and fellow Psychologist) of Beths. Quick Beer at midnight at the local bar then straight to sleep- very hard bed but made no difference ! ! Have our own shower/toilet and share kitchen, living spaces with 4 others – Richard (English), Anna (half English/Portugeuse), Sylvain (French) and Hamilton (Brasilian). Dave up early to go to shops for bread. Took a wrong turn out of the gate and…. although found shops couldn’t find the house again. Eventually spotted Shelagh who had come to rescue him about an hour later ! ! Now know ST really well. Afternoon to the Project – a warm welcome from Martina and met 2 German volunteers (Marcel and Emmy-Lou). Hugs from those who knew us from last year and introductions to the others. Children spent all afternoon practicing for the Samba Party scheduled for Sunday. Those not involved playing games. Star of the band is Duda (only 7/8) but plays the cornet really weel. Back to the house and ate out at a place we knew that does great Pizza. Saturday –went to convent to see Rose and then met up with Beth and Tom – a days shopping for the Samba party. Food and stuff around Centre always looking for the cheapest and then Supermarket (Mundial) in Lapa for the alcohol. Car weighed down at this stage. Returned home hot and shattered. Subscribed to a system where you can watch BBc, ITV , Channel 4 iplayers abroad (£5 a month). Tested it out – a bit fiddly and need good wireless but managed to watch Strictly and Football. Sunday – Mass in the morning then the party – scheduled for 2 pm so we turned up at 3, nobody there, started after 4pm. Should have known ! ! Our job was the bar – Marcel who is only 19 has worked in a bar so was in charge of the Cachaca . Food available (Fejuada). Childrens band which are training for the Blocos played on the balcony led by Tom and Manguineiro (?? Drummer leader) – photos and video on Facebook and Google+. Then Tom and friends played. Finished about 11pm and good mixture of locals and gringos (Toms friends). They will hold one now at the beginning of every month – when people still have money ! ! Tuesday –. PM – English led by Martina who is brilliant. T1 – very young and many of them. Many cant read and write so we will get them into smaller groups as much as possible as there will be at least 3 of us each time. T2 and T3 there English is progressing better than when taught by us due to Martina and we can do quite a lot with them especially T3. Wednesday – Into SARA to buy materials, food and get more cash PM – Football for the boys so Shelagh started the Modroc masks on the girls – got them all through + the boys on their return and some of the tutors. Great fun and greatly helped by Joycie and Tuamy of T3. Evening – Curry night at Toms – he has a place in the Favela by the convent. He is in the basement – balcony has superb view over Guanabara bay. After induction we made fresh Nans and Marcel the bar. Above Tom lives a Frenchman who runs the rest of the building as a Hostal. So clientele – Toms friends and people staying above. Beth networking. Made about £100 for musical instruments. Thursday – chilled morning as tired. Project – children wanted masks but we did English as TTabled – parts of the body so drew monsters for Haloween party. T3 – Jose Victor pretended to be teacher so we sat at the desks and started playing up/behaving like they did. It was so funny. In the end he threatened to send us to Monica so we looked frightened and behaved ! Friday – SARA again – paints for the masks and materials fo Halowwen (and supermarket shopping)> Project masks made for those absent on Wednesday then we trimmed and sealed them all with glue – ready for next weeks painting. Home to cook and watch Corrie and Have I got news for you. Saturday – writing out our thoughts for next years Development plan. Down to Parc de Ruinas for a brew and sit in a cool breezy spot. Walking back demonstration by residents against violence in the community (Sylvain there). Beth picked us up and down to Urca/Vermelhia beach for food, beer and a chat. Sunday – Mass at the convent, with Martina to the project to prepare for Haloween party . Dinner at the convent then went to see Shelaghs friend Monica. Her house has been under renovation since we left but was pleased to see us and had a good cht She is always interesting and funny. 4 pm Beths – meeting with her and Tom re-development plan and the To Ligado Bloco band – uniforms, colours . Publicity for the next Samba party etc. No water in most of Rio (repairing pipes) so simple meal!